SEBRING, Fla. - One of Corvette Racing's familiar yellow C6.Rs will have an all-new look when the green flag falls to start the Mobil 1 Twelve Hours of Sebring today. The crew of the No. 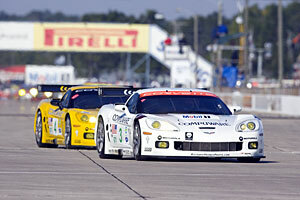 3 Compuware Corvette has transformed their race car from Velocity Yellow to Arctic White. The new look salutes the limited edition Ron Fellows ALMS GT1 Champion Corvette Z06 that was unveiled at the Chicago Auto Show in February. Fellows will share the glistening white machine with teammates Johnny O'Connell and Jan Magnussen in the classic 12-hour endurance race. It's the first time since the 2003 24 Hours of Le Mans that a factory Corvette has raced without its trademark yellow livery. Led by 2006 GT1 Crew Chief of the Year Dan Binks, the crew of the No. 3 Corvette C6.R replaced all of the yellow body parts - fenders, doors, hood, roof, rear quarter panels, door sills, and front and rear fascias - with new white panels. The team also installed a fresh LS7.R race engine, drivetrain, and brake/suspension components as part of their routine pre-race preparation for today's grueling 12-hour contest. "Ron Fellows is part of Chevrolet's racing heritage, and he has been instrumental in the remarkable success of the Corvette Racing team in the American Le Mans Series," said Ed Peper, Chevrolet general manager. "The special signature-series Z06 model that bears his name will forever link him to one of the greatest eras in factory racing, which has produced six consecutive ALMS GT1 manufacturers championships, and counting." This special Corvette Z06 is the first signed special edition in Corvette's 54-year history, and is the first Arctic White Z06 ever offered. Only 399 are planned for production: approximately 300 for the United States, 33 for Canada and 66 for other export markets. The Ron Fellows ALMS GT1 Champion Corvette Z06 will be available this spring. It carries an MSRP of $77,500, including destination. The Mobil 1 Twelve Hours of Sebring, the first round of the 12-race 2007 American Le Mans Series, is scheduled to start at 10:00 a.m. ET on Saturday, March 17, 2007. Portions of the 12-hour race will be televised live on SPEED Channel from 9:30 to 11:00 a.m. and 2:30 to 10:30 p.m. ET.